With their heralded wrapper leaves grown in the Central West African country of Cameroon, the Partagas Cigar is unmatched in its flavor and construction. Producing a rich taste, this medium to full-bodied cigar is a must have for serious cigar smokers. The Partagas Maduro - No. 8 is a popular choice, but do not pass over the Partagas Robusto or the Partagas Limited Reserve Decadas. 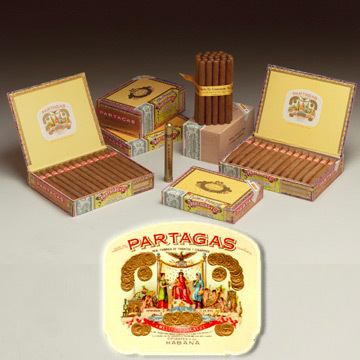 When it comes to choosing a Partagas cigar, the only mistake you can make is to not pick up a box. With over 150 years of history originating in Cuba, it is easy to see why Partagas cigars are a highly rated, top pick of cigar aficionados.